Meathead Movers is here to take care of the heavy lifting for you on your move to Sanger Movers. Our clean-cut student athlete movers are ready to get you safely settled into your new Sanger Movers home. Meathead Movers is proud to be your Sanger moving company! Known as The Nation’s Christmas Tree City, Sanger is a small city located just 13 miles outside of Fresno, California. Families moving to Sanger will find that the city offers much more than just the famed General Grant tree. The city also offers a wealth of family-oriented recreation, education and entertainment opportunities. For those looking to make the move, working with professional Sanger movers is a great way to cut down the stress of relocating. Sanger was incorporated in the early 20th century after serving as an important stop on the Southern Pacific Railroad line. Though the railroad is no longer a primary economic driver, the original depot has been converted into a museum that residents and visitors alike enjoy visiting. The museum boasts exhibits on everything from life in early Sanger, to the native people of the area, to information on local flora and fauna. Thanks to its temperate Mediterranean climate and many outdoors recreation opportunities, Sanger is a popular destination for many families and outdoor enthusiasts. The city lies about an hour from King’s Canyon National Park, where visitors can see striking sequoias and redwoods. The city hosts an annual Blossom Trail Run the first Saturday in March to celebrate the Central Valley’s rich agricultural history. While Sanger itself is relatively small, moving to the area can still have its difficulties. At Meathead Movers, we are here to take the work out of relocating by acting as your Sanger movers of choice. Our employees are all clean-cut friendly student athletes. We believe in making the most of your time, so we jog when we are not carrying your possessions. In addition to hiring only the best moving staff, we use state-of-the-art technology in our offices to ensure that your local, long-distance, and commercial moves go smoothly. If you need a little help getting ready ahead of time, you can call on our Princess Packers to box up your possessions. Our moving concierge can even put you in touch with service providers and utility companies in your new area. We believe in what we do, which is why we offer a 100% satisfaction guarantee to all our customers. Moving to Sanger means moving to a welcoming family-centric community. 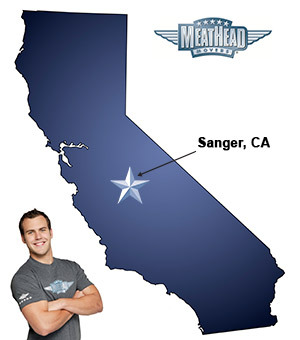 At Meathead, we are proud to be your Sanger movers and are here to take the work out of relocating. With our 100% satisfaction guarantee, the only thing you have to lose is the stress that comes from moving! So contact us today for a free moving quote. “They were very professional, friendly and curious. They worked very quickly and took great care in handling of all items being moved. They were very professional, friendly and curious. They worked very quickly and took great care in handling of all items being moved. We were extremely pleased with their service! The young men were very professional and gentle with our items. Great young men. Each and everyone of them were polite, hardworking and attentive. They took a lot of the stress out of moving. Thank you! The experience was smooth beginning to final delivery. Estimate and policies was explained. Appointment was convenient. Movers arrived 20 minutes early to review the job and complete paper work, so their work began on time. Home and furniture protection was done well. On phone and in person the staff curtiuos and professional. We had large furniture that had to go down a narrow hall.